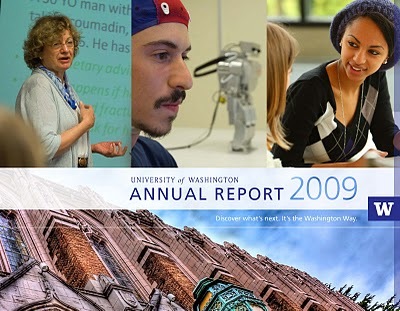 Today was an exciting day for me because I'm finally able to let everyone know that a photo of mine that I shot of Suzzalo Library was selected to be on the cover of the University of Washington Annual Report. What makes this even more exciting is that not only am I a UW alum but I also am a CPA who has looked at plenty of annual reports. It seems only fitting that an annual report is the first place one of my photos has been published. The same picture of mine from the cover will also be a full page spread on the inside of the report. 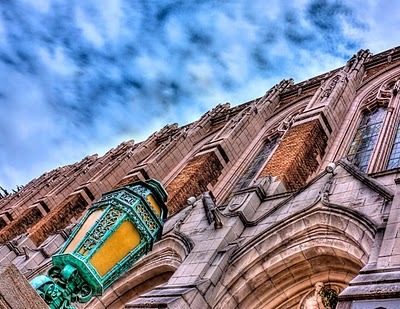 Back in August this year the Creative Production Manager from the UW Marketing group contacted me about a photo of mine of Suzzallo library that I had posted on Flickr. He asked if they could purchase my photo and post in some UW Marketing materials. He hadn't told me yet which ones. Of course my response was...."let me check with my agent." OK I won't lie....I was giddy like a little school girl. I promise....ask my wife, Mandy. Since August it's been a waiting game as they were deliberating on which photo(s) to use and their marketing/distribution strategy. I didn't want to tell anyone cause it hadn't been finalized. I got word yesterday that my photo was indeed being purchased so I was happy to share with all of you the exciting news! Note: the report design does not receive final, official approval until after the UW Regent’s meeting in mid-January. If you haven't already entered my giveaway don't forget to check it out here on my previous post: What a Year it's been! Check out my giveaway!